Pickering Labs would like to congratulate the winners of our last newsletter’s Baseline Noise Quiz: Joel Fray from Colorado Analytical Laboratories, Jim Balk from Nebraska DHHS Public Health Environmental Laboratory, Narjes Ghafoori from LA County Environmental Toxicology Lab, Hossein Hajipour from Texas Dept. of Health Services Laboratories, and Tom Schneider from Suffolk County Water Authority. They have each won and will shortly receive a decadent Chocolate Dream Gift Basket! 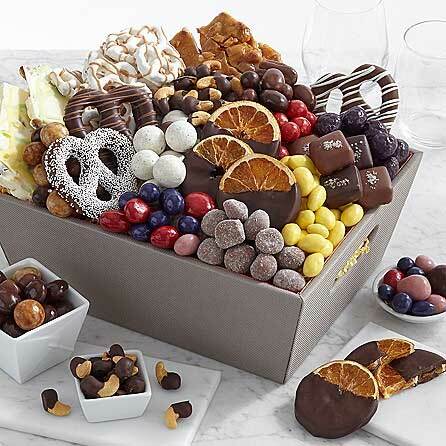 Created by Cherry Moon Farms, this lovely basket is the ultimate assortment of chocolate sweets that will surely delight! Congrats to our quiz winners and enjoy the goodies! The zoomed baseline exhibited sine wave with regular oscillations at frequency of about 6 sec. This type of pattern is characteristic to HPLC pump noise as reciprocating HPLC pump moves to deliver the flow of eluants through the column. If pump is operating normally, the oscillations are very small and will not show as baseline noise. But if the pump has dirty/bad check valves or old/poorly installed seals, the noise increases. In our case, the HPLC pump check valves were bad and needed replacement. What is causing the retention time shift in the chromatogram below? Simply email your answer as well as your full contact information to Rebecca at rlsmith@pickeringlabs.com by May 1st, 2017 in order to win. You will receive email confirmation that your submission has been received. The answer to the quiz and winner congratulations will be published in the next issue (to be anonymous, please notify Rebecca in submission). Pinnacle PCX post-column instrument is being used, in a traditional HPLC setup as recommended by Pickering Laboratories. The quiz question: what is causing the shifting retention times?